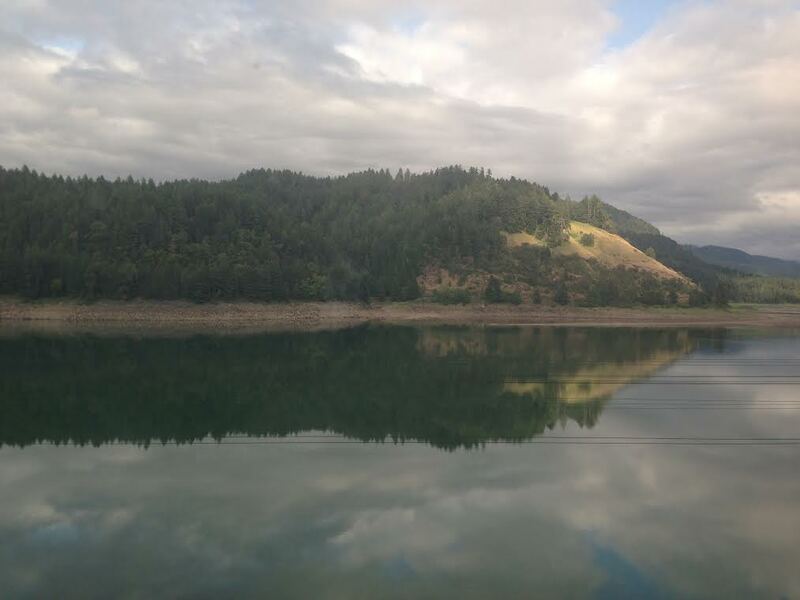 This is the view from the Amtrak Coast Starlight train as it journeys through Oregon, from Seattle to Los Angeles. I took it this summer, after wrapping up a gig with ASU’s Center for Science and the Imagination at a publishing event in Vancouver. I’ve wanted to take this particular train trip since first hearing about it, years ago. The part of me that is still a child watching a Betamax copy of North by Northwest taped from TV remains fascinated by train travel, by the opportunity to see a country reeling away behind you like a film strip, and the opportunity to meet people you’d never meet, otherwise. But to take the trip my parents and I used to drive so often, this time by myself and on my own dime, seemed like an affirmation of my adulthood. I frequently travel alone. A month after this trip, I took a trip to San Diego Comic-Con alone. After that, I traveled to London alone. Earlier this year, I traveled to Manchester alone. I had been in Vancouver alone. I am always with people during this sojourns, whether as a speaker or a consultant, but while I often try to bring my husband — as I did to Sweden, Iceland, and Scotland last year — I am most often on the road alone. This solitude means I have more time for talking to strangers. Because I am not otherwise engaged in conversation, I have more time for everyone around me. I can (and often do) dive into my phone, but that’s a species of only-child introversion and not a judgment of others. (Who would want me to saunter over and strike up a conversation ex nihilo, I wonder. No one, is the answer.) But I meet more strangers this way, and meeting strangers is how you break out of that dreaded “filter bubble” that Wired says is destroying democracy. In San Diego, for example, the conversation I had most often was not about comics, or movies, or superheroes. It was about the price of real estate. The car-hire drivers I spoke with all had the same story about coming to San Diego: they came for one reason, but stayed for its beauty and its weather. (I myself was unprepared for how beautiful the city was, and understood the longing to stay.) But now they were all being priced out of their neighbourhoods and forced into longer commutes. The story was the same in Vancouver, Seattle, and Los Angeles, and London, and Manchester. Every cab driver, barkeep, server, or customer service rep I spoke to was under the same pressure. These were not “coastal elites.” They were working people relying on tips to make rent. Sure, they might have attended university. But that didn’t matter. Not when student debt was keeping them from affording a mortgage, having a child, or growing their own business. These are the people that automation is trying to replace. Waitstaff. Cab drivers. Concierges. Ticket takers. After the election, Canadians asked me about a possible repeal of the Affordable Care Act, or a privatization of Medicare, and how it would impact my parents. “In America, no one wants to kill you. They just want you to die,” is how I would answer. They want you to die of poverty, or diabetes, or cancer, or illiteracy, or a learning disability, or another kind of disability, or PTSD, or abuse, or who knows what. But if you could just get on with it, that would be great. And it would make America great. This isn’t to say that Americans as people want you to die this way. Some of them do, probably. But not all of them. Not by a long shot. But these are the rules of the game that is being an American. The rules are not designed for you to win. If everybody won, then the winners couldn’t feel like winners, any longer. These are not the people you meet in airports. I do meet people in airports, of course. I was sitting at an airport bar in San Diego watching the Democratic National Convention when the East Asian guy sitting next to me asked me what I did. I showed him the cover of Company Town. (“You wrote that?” he asked. He looked me up and down. “You?”) But by and large, airports are not social hubs. Security theatre inhibits any kind of intimacy at airports. Everyone is too paranoid about their bags and belts and shoes to have a conversation, and the thing you want most after dealing with the TSA is not a nice chat but a stiff drink. Moreover, air travel is about flying over, not travelling through. The thing about train travel is that it allows you to pass through towns, not above them. This may sound twee and obvious, but that doesn’t mean it’s not true. Trains and their stations are often the oldest piece of municipal infrastructure: especially in the Western United States, cities were built around train stations and stops because they were the access points for shipments of lumber, bricks, tools, and labour. Like the Jesuit missionaries who built a mission at the end of a day-and-a-half’s walk, train stations meant reasonable distances between cities. And so at train stations, you’ll see older architecture. Advert murals. Little parkettes with bandstands. Remnants of the hope that once burned in a community. Travelling by train also means seeing where this hope has burned out and died. Older buildings, surrounded by FOR LEASE signs. Empty lots. Plywood sheets with spraypaint sigils: “FIREWOOD” “LIVE BAIT.” “WE BUY SCRAP.” Cars on blocks. Spaghetti dinner at the church, tickets five dollars. These are the places where the apocalypse has already happened. These are the towns where The Walking Dead is aspirational programming: a world that’s all guns and no banks. When we fly between cities, it’s easy to forget these towns exist. It’s easy to forget that the people who live there exist. And that’s how you lose an election. But it’s also how you lose a country. It’s how you lose a sense of who you are, and who you might have been, and who you might still become. A strong national identity and robust social safety net are not mutually exclusive, and they often overlap in countries with good transit. This is not an accident. People are more likely to pass laws that help their neighbours when they see those neighbours. 2016 was a hard year for a lot of people. It was a tough year for me as a creative person, even though I wrote a short and art-directed a short film, finished a novel, wrote a couple of stories, spoke at some conferences, and so on. I was supposed to do more. But every time I sat down to write, I couldn’t focus. Staring at Twitter felt like rubbernecking at the world’s biggest car crash, and yet I couldn’t look away. This year, my group of friends lost two women to cancer. This year, I went to the hospital with something that felt like a heart attack but might have been a panic attack. This year I tried to meditate, and failed. I tried to keep weight off, and failed. I tried to write more, and failed. 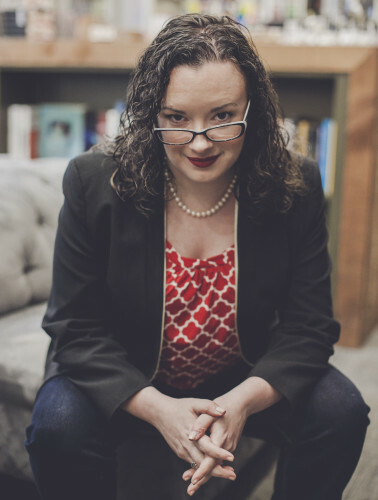 This year I wrote the third Machine Dynasty novel, starring Portia, and I feel as though she poisoned me from within. Summoning her felt like summoning an evil spirit. The trick to writing Portia, you see, is to write down all the things that depression has ever told you, and then make a robot say those things. (Or, in this case, a globally-distributed adaptive intelligence whose primary sensory organ is the world’s surveillance apparatus. But I digress.) But this time, when I wrapped up the book, I couldn’t get rid of her. She stayed with me. And I listened to her. The only thing that could silence her, I found, was being out among other people. Whether it was meeting friends for coffee, or teaching my students at OCADU, or attending conferences, or even just talking to strangers on trains, it almost always helped. It is easy to feel fatalistic about 2017. It is easy to feel sick with dread. Those are normal responses. But quickest and easiest way to firewall against whatever is coming is to strengthen your local community. Spend time amongst your neighbours. Make sure they see you and you see them. Let them know you’re there. Let them know who you are. I get this. I’ve felt it, lived it, believed it for years. I have a trip coming up in a week or so to Las Vegas. I’m driving, not because it’s easier or quicker or cheaper (it isn’t), but because it’s a chance to connect with people and places that I would normally never get to know. Everyone thinks I’m crazy for driving, but being “on the road”–whether it’s driving or by train–is an experience that is unique. Plus, it’s always a chance to disconnect from all of the digital mindlessness and the normalization of madness that we get pushed in front of us every day. It’s a chance to slow down and look at things from a calmer perspective. We’ve lost our sense of community, I think, and become a nation of tribes and micro-groups that can’t see the big picture.